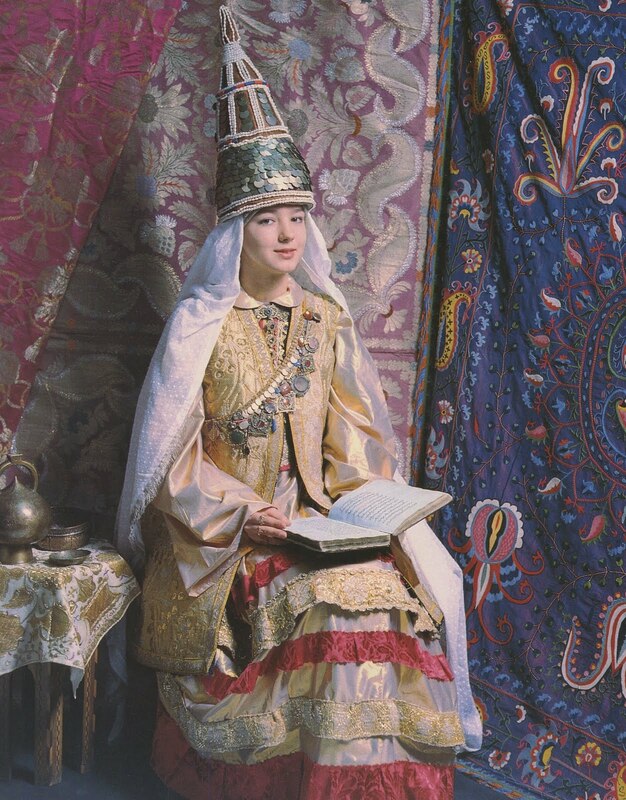 Today i am going to present some more information on the costume of the Kazan' Tatars. 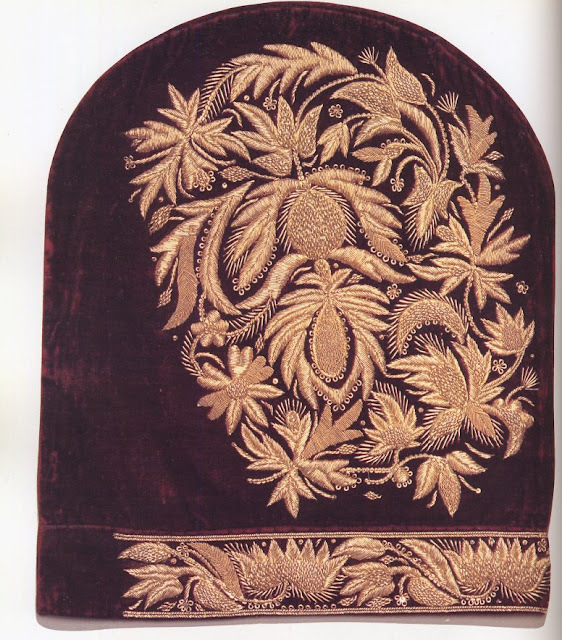 Specifically the richly embroidered headgear, the kalfak. This is still the town costume. Peasant costume will be in another forthcoming posting. If you look at the portrait of the princess i showed you in the previous posting, you will see that she is wearing the ancient headress 'kashpau', a tall stiff cone shaped hat which has cognates in several central Asian cultures, most noteably the Kazakh and the Kirghiz. Here is a reconstructed costume of the 16th cent. In the 18th cent. 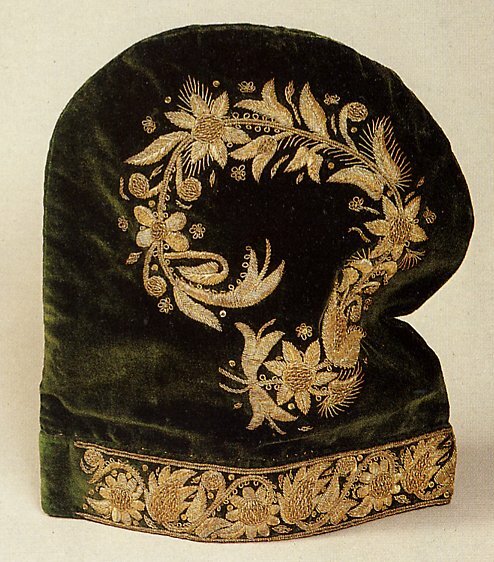 this was replaced by the kalfak, a stocking cap knitted in more or less the same shape, with bands of velvet sewn on, and then 3 dimensional embroidery done all up one side. Since the cap flopped over when worn, only one side is visible. Here is a woman wearing the soft kalfak. 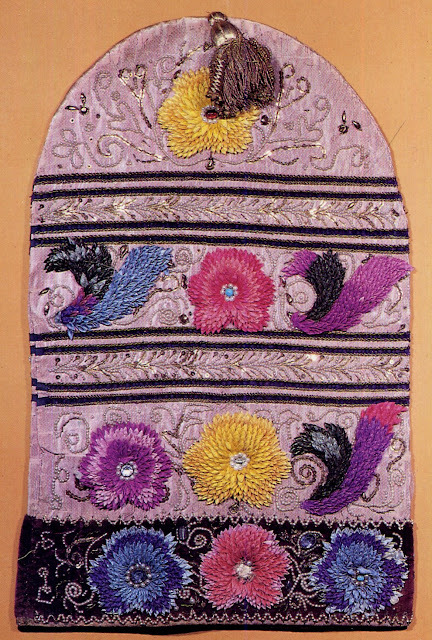 ﻿The kalfak was worn with a band around the base. I dont have any images of the band by itself. There were two kinds of embroidery done on the kalfak. Both were freehand floral designs of great richness and in three dimensions. The first kind is basen on chenille yarn. Here is an example. And here is a closeup of this type of work. 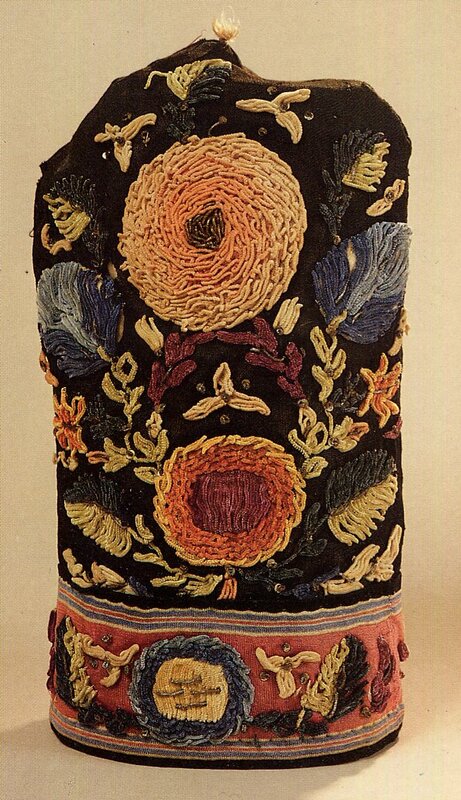 The second type is made up of ﻿little pieces of silk folded and curled up, which are then appliqued onto the kalfak so as to make petals of flowers. 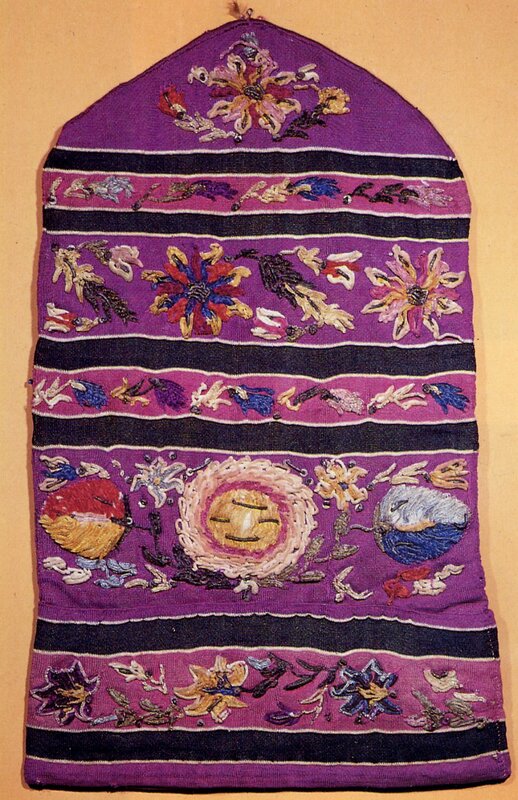 Here is an example of this type of kalfak. 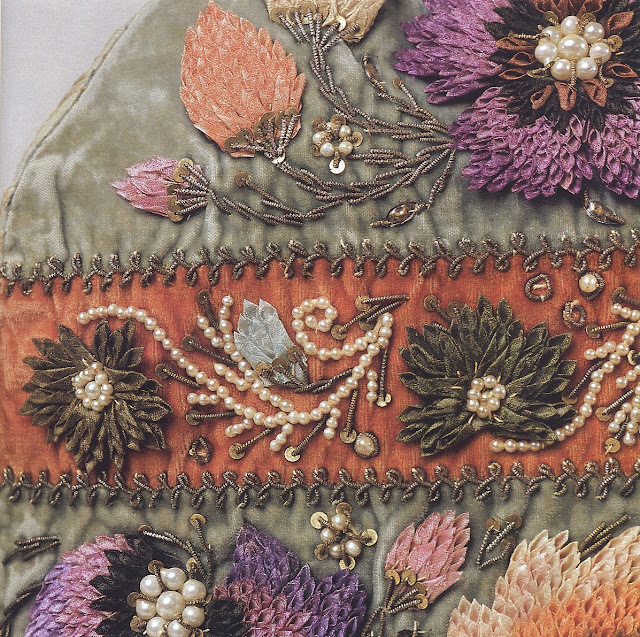 And a closeup of this kind of embroidery. Both types were accompanied by sequins, beads, pearls and twisted metal wire. 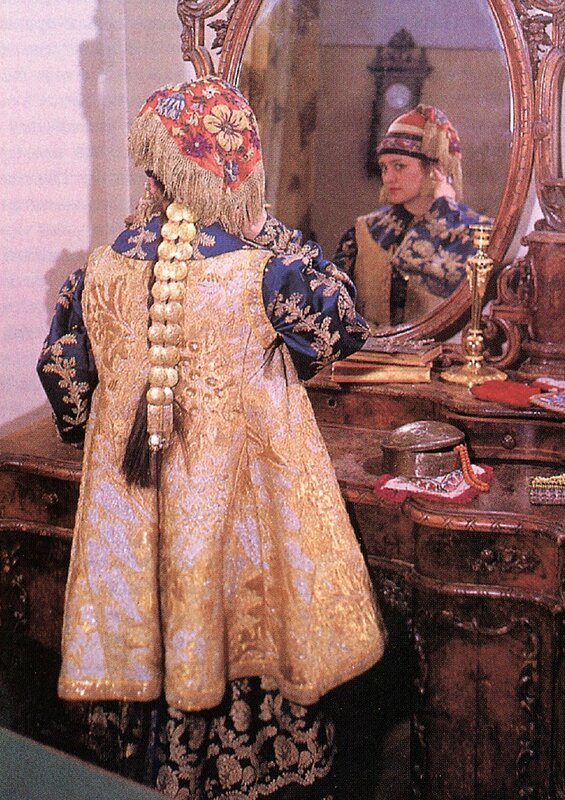 Here is a photo of a young woman wearing this type of kalfak and holding another one stretched on a frame in order to be embroidered. Later on, in the 19th cent. 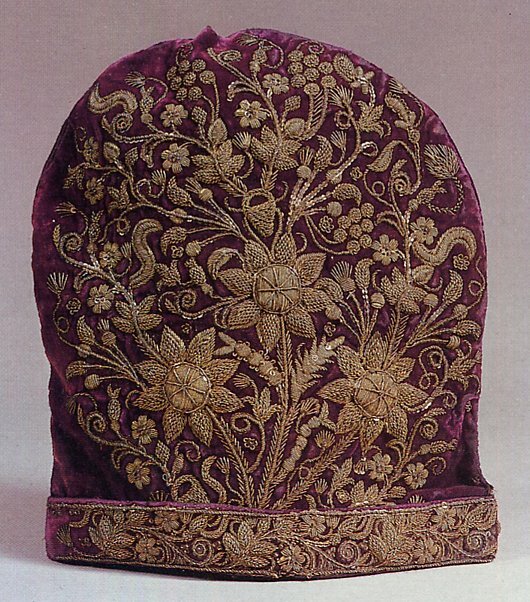 a rather smaller kalfak of velvet with gold embroidery became popular. Here are some young women wearing this type of kalfak. They have an embroidered band around the base, and are worn without any seperate headband. 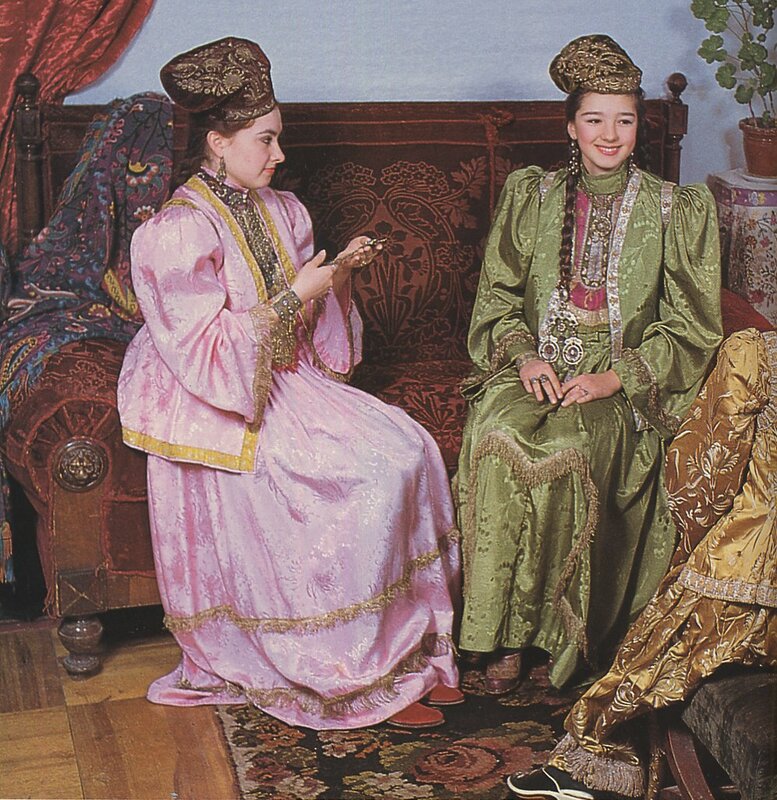 They are sitting on european style furniture, and notice that the dresses have been modified with set in sleeves gathered into a peak on the shoulders. The basic costume remains essentially the same, however. Here are a couple more examples of this kind of work. Older women often wore a shawl, the orpek, embroidered in chain stitch, with a plain fur and velvet cap. 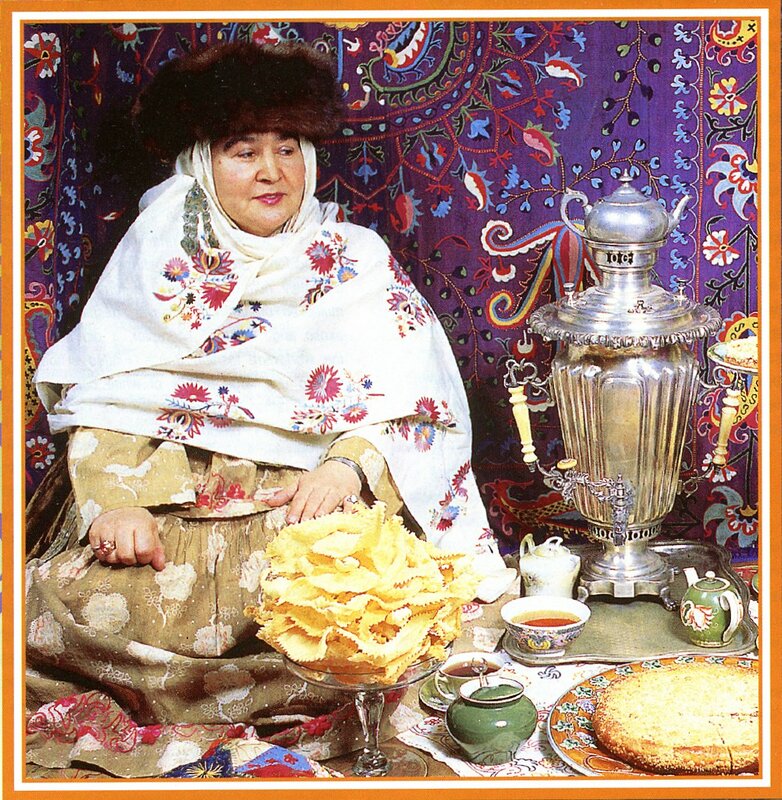 Here is such a woman hosting tea in a much more traditional house than the modern young ladies above. Note the chain stitched wall hangings and the chain stittch embroidery on the hem of her dress. I hope this has inspired someone. Thank you for reading, as always. Feel free to contact me with requests for research. I hope to eventually cover all of Europe and the Former Russian Empire/Soviet Union. I also gratefully accept tips on source materials which i may not have. I also accept commissions to research/design, sew, and/or embroider costumes or other items for groups or individuals.